Good quality of insulation between stator iron laminations is one of the major preconditions for proper operation and top performance of generating units. Local hot spots and overheating as a result of insufficient insulation between stator iron laminations will cause premature aging of high voltage insulation on stator bars. Also, it will damage the stator iron core and cause the loss of power in generators. 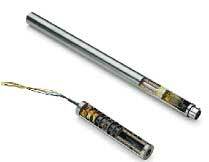 SWP - Stator Wedge Probe is a precise tool used to detect loose wedges in Generator or Motor stator slots. SWP instrument consists of Universal Stator Slot Scanning Head holding electronically controlled - Linear Variable Differential Transformer (LVDT) with signal conditioning. SWP detects movements with micronic precision and imports them into the graphic SWP software or simply show them on the SWP - Central Processor Unit (CPU) digital display. SWP software categorizes wedges into 7 (SWP-7) or 30 (SWP-30) different categories. SWP-7 unit is excellent for testing stator slot wedges in generators. SWP-30 unit is convenient for motor stator wedges and precise laboratory movement tests. Our Dual (D) SWP-7D series instruments are designed to have option of holding SWP (Stator Wedge probe) or CDA (Core Defect Analyzer) type tools in the Universal Stator Slot Scanning Head and condition one signal or another. This has been the best choice for power utilities to have option to scan their stator slots and obtain information on wedge looseness and / or stator iron damage using the same tool with different attachments. DC LVDT's incorporate a small encapsulated carrier generator/signal conditioning module. High permeability, nickel-iron hydrogen-annealed core for low harmonics, low null voltage, and high sensitivity.